I was looking for some up to date references for my woodworking classes and came across Collins Complete Woodworker's Manual. YES! Printed in a way that would attract 21st century teen-agers through to seasoned veterans. It's comprehensive, with up-to-date illustrations on woodworking and includes stunning colour photographs. A special feature is a chapter detailing with the characteristics of a huge variety of timber with plates clearly showing each, and the effect of applying a clear finish. To give you an idea of how well the book is illustrated, a lecturer in publishing commented: "I would recommend that anyone interested in the design and production of explanatory drawings should take a look at this book by way of example." Importantly the book deals brilliantly with design, and provides ergonomic data, using actual three-dimensional designer's sketches, to illustrate the basic principles of chair, table and storage-unit construction. Gee this is well done! There are ideas for selecting everything from the best joint for the job to the most efficient order of assembly. For the tool buffs, this book boasts an unrivalled illustrated survey of every type of tool “ from the bench plane to the power router, and a Japanese saw to a universal machine “ and each is comprehensively described to help the novice, inform the tool buyer and assist the experienced woodworker to plan and stock a safe machine shop. There is great chapter on joint making with photographic examples, working text and step-by-step drawings of every type of joint. It even shows you how to set out a beveled dovetail! Whether it is turning, woodcarving, veneering or marquetry, bending or finishing wood, the book provides detailed coverage of those crafts and would be appealing to every woodworker. There is even advice on using such materials as metal, glass, marble and leather in combination with wood. Add to this a comprehensive range of fixings and fittings â€“ from the latest in adhesives to locks and handles “ and you have everything you need to complete the job. Looking at other reviews the book is variously described as "A fine book", "Well thought out and well designed", "A friend to lean on", "Thoroughly authoritative, well-illustrated and well-produced" and "An absolute must for the bookshelf"
As a woodworker, I enjoy the time spent in my workshop building furniture and other challenging woodworking projects. Because I'm not working with an unlimited budget, I need to keep my eyes on the bottom line throughout the entire project to make sure I don't underestimate it. This task is unfortunately the least enjoyable because it's mostly done out of the shop with a piece of paper, a calculator, and messy sketches. But I now have a new tool as useful as my table saw to help me out with this chore and it's not what you thinkâ€¦ It's a software called CutList Plus developed by Bridgewood Design (http://www.cutlistplus.com). This product serves two main purposes: powerful estimating and sheet layout optimization. As for the estimating part, everything use in your project from the wood, the hardware, the finishing products, and the labor can be calculated to generate accurate estimates for yourself or your clients. There's no important learning curve issue involved here because the user interface is very similar to a Microsoft Excel spreadsheet which uses tabs, columns and rows. You simply enter your list of parts of rough lumber, dimensioned lumber or sheet goods and CutList Plus does all the work for you to figure out the amount of wood you will need and how much it will cost. Getting all that information is worthless if you have no clue how the software has laid out your parts on the material. Here comes the powerful layout optimization to tell you graphically what will be the best fit. You can print out those layouts for yourself or those in charge of cutting the parts. The gem of this product lies in the variety of optimization patterns available individually for each sheet good. You don't have to accept blindly what the software gives you in the first place. It's all up to you to pick other choices that may suit your work habits better. Speaking of optimization, you can also tell CutList Plus to optimize the layouts by using your off-cuts first, minimize the overall cost, or minimize the waste, etc. You can also specify individually for each thicknesses of sheet good your preferred first cut direction (with the grain or across the grain). Playing with all those variables will produce a wide array of possible layouts to choose from. If CutList Plus was only that, it would be a great tool already but it has a lot more to offer. You can manage your inventory of material by increasing or decreasing your inventory levels based on your cut list as well as entering your own wood species or sheet goods dimensions. CutList Plus works in metric and imperial. I've used CutList Plus for the first time about 1.5 years ago for a big furniture project which had a lot of MDF sheet goods in it. I had to go through several design changes throughout the project and I was getting up to date estimates in a manner of a few minutes of work with the software. CutList Plus is now offered in a French version at: http://www.cutlistplus.ca. Get some workshop time back for yourself and leave your calculations and layouts design worries to CutList Plus. 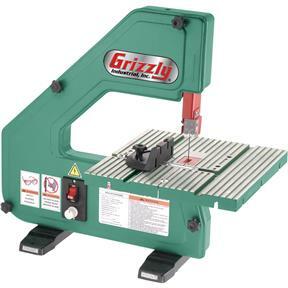 This is a low end fairly cheap 3 wheel bandsaw, so my rating takes that into account. In other words, the rating has a "for the price" (which is around $150) qualifier. When the bandsaw arrived, I just had to bolt the feet on, bolt the table on and then plug it and test it. There was a 1/4" blade preinstalled. But the speed control did not function properly. After I turned it up to high it would not turn back down. I also had a bent knob screw. I contacted Grizzly and they sent replacements. The replacements had the same problems. I contacted them again and this time a technician called me and promised to hand inspect and test the parts before sending them. He did and they work fine. If you need to use the saw for ripping stock, I have used TimberWolf blades in the saw and I would recommend getting a 3/8" 4 TPI PC blade with some caveats. The stiffer blades are harder to change. They do not warrant their blades at this length. You should use it only for ripping straight, which it does *much* better than the thinner blades that are recommended for the saw. Don't saw curves and don't back up any at all while the blade is in motion or you may break it. Use less tension than required for other blades. Run at about 1/2-2/3 speed. It will be much louder with the TW blade. You should put it on immediately before use and take it off immediately after use. With all those caveats, why do I recommend this? Because it will rip 4/4 stock ignoring drift 8/4 stock if you account for drift. And I mean rip it well; nice straight edges. For general purpose blades, the best source I have found is Sears. They have a 1/8" 15TPI that is great for fine work on thin boards and a 3/8" 6 TPI that is good for most uses. The dustport fits a 1.25" vacuum hose and is positioned perfectly. I get no noticable dust in the air and there is very little inside the machine when I clean it after use. It runs fairly quietly. I use it in an attached garage while others are watching TV or sleeping a couple of rooms away. I had been waiting a long time to purchase a replacement for my old Delta Rockwell lathe (student model). It had been a starter lathe that I had used for awhile as I learned to turn wood. It used a wrench to tighten the tailstock and tool rest and I had to change the belt by hand. As time went on and I grew in my ability I decided it was time to replace it. I wanted to do more. I had bought a 2nd lathe, a Jet mini-lathe , which I loved, but I still was confined in what I could do. After 14 yrs with the old Delta, it was time for a change. I had my eye on a Powermatic lathe. It was very solid and quiet but I couldn't really afford the $3000. price. When Jet came out with their two new models, the 1442 and 1642 models, I finally found some affordable competition. At first, the Jet 1442 was on my list. The headstock has a swivel head and the headstock can slide to allow the turner to turn larger objects by moving it to the end of the bed. It could change speeds with a manual lever that uses sheaves to change the speed. It was very quiet and could take up to a 14" bowl. It came with a 1hp motor. It sells for about $700.00 Delta's new lathe was very close in price and quality and in it's features. I felt the Jet was a little more polished but the Delta got higher marks in a recent review for vibration. Then I saw the Jet 1642. It could take 16" large items. It's headstock can also slide to the end of the bed to work on much larger bowls like its younger brother, the 1442. However, the 1642 does not have a swivel headstock. Where the real difference lies is in the motor. The 1642 has either a 1.5 hp or 2hp with an electronic controlled speed feature. It also lets you reverse the direction which is very nice when you are sanding. Being able to slow the speed down to very low speeds and still have lots of torque, was WONDERFUL. I thought I had died and gone to heaven! I got the 1.5hp model (the 1.5 is a 115v, the 2hp is a 220v motor). The motor is superquiet. All you can hear is the sound of the fan in the motor. Both the 1442 and 1642 models have a bracket in the cast iron legs to allow a shelf for things like adding sand bags. (both models use the same stand with heavy cast iron legs) In spite of the heavy and quiet lathe, I did find a little vibration at certain speeds while I was turning some larger work. I bought 2 bags of sand and put in a shelf and voila', that was the end of my vibration. The other difference between the 1442 and this 1642 model is the price. I mentioned the 1442 was about $700 or so; the 1642 was more like $1700 (after tax for me) Because I wanted this to be my last lathe, I decided to spend the extra amount. It is still almost half the price of the Powermatic and easily as quality a lathe. I can turn large and heavy bowls and the ability to slow down and speed up the lathe is something every turner should have, in my opinion. Negatives? A few: 1. they include 1 faceplate, a massive 6" steel faceplate. It's great but how about including a second smaller one? They're cheap to make, why not include it. 2. The revolving live center included was also pretty cheap in quality, compared to the lathe. I thought they cut corners where they shouldn't have. 3. Because both the 1442 and 1642 offer the turner the ability to slide the headstock to the end of the lathe to work on large bowls, they should offer either a floor stand for the tool rest or and adapter for the tool rest to be mounted on the end. Again, even drilling holes in the support legs to allow it could have been added for very little cost. I could not find a seperate tool stand or option to allow for it. They could learn a little from Delta in this way. I love my new lathe. It is high quality and sets the standard for price/quality in my opinion. Though they offer a 12" model for new turners. However, it is only about $100-150 more for the 1442 which is a much more substantial lathe. Anyone looking for a good quality lathe for not too much money can't go wrong with the 1442 or the 1642.